Health Care CON GAME !
" I Can Not Support A Public Option" ! That is the main message that Senator Olympia Snowe has made certain to get across during every one of her barrage of interviews which have taken over the cable news airwaves. Yesterday, Snowe was the lone Republican vote in the 14-9 decision to pass the Senate Finance Committee's version of so-called health care reform. Although this senate plan is actually the very worst out of the five different versions drafted, it is being touted in the media and by various politicians as a great triumphant achievement...as if the passing of the other 4 were absolutely meaningless. Fact is, if the Senate plan was to actually pass as it is, Americans would be in WORSE shape than we are now. NO Public Option combined with a mandate, guarantees that this Senate Finance Bill will be of great benefit to the insurance industry while simultaneous slapping We The People, the supposed purpose of health care reform...in the face. So why is the worst of the plans garnering such accolades ? Because we are being strategically played like ill-informed fiddles by BOTH the Republican AND Democratic leaders. Just one look at the amounts of money ( legalized bribes) both the top Democrats and Republicans have received from the health industry lobbyists shows exactly who they are loyal to...and it's NOT We The People. Thanks to the power of the lobbyists, leadership on neither side of the isle really wants any type of TRUE reform that would effect the pockets of the insurance industry (their bribers), but they do want to APPEAR as if they are working so diligently for the much needed health reform (of which 77% of Americans want a strong Public Option). And did I mention the sad truth that the Democrats have received more payoff money than the Republicans ? In other words, the Dems are lining Snowe up to be their EXCUSE to end up with a final bill that caters to the insurance industry, and against The People ! In fact, Majority Leader Harry Reid is already on TV today saying that "...legislation is the art of compromise..." or in other words...we have to do what THEY want. PATHETIC ! Keep in mind, Democratic supporters across America worked hard volunteering, making calls, door knocking and WON a filibuster proof 60 Democrat Majority in the Senate. 60 votes is all that's needed to pass ANY bill including health care reform with a strong public option. So it's not the Republicans that are the problem, it's the Democrats who won't vote for what the party promised...true health care reform. In fact, if the Democrats REALLY want to pass health care reform with a strong public option than they can just do so with what is known as a 51 person Reconciliation vote...they don't even need 60 ! It is the responsibility and job of Senate Majority Leader Harry Reid to LEAD his fellow Democratic senators to get on board and do what is right for America. 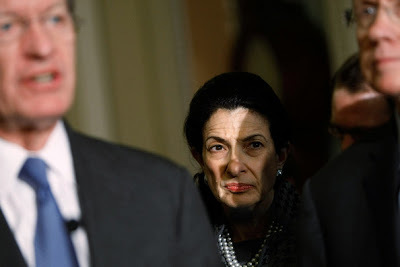 Olympia Snowe ? That's a JOKE ! It is time NOW for Harry Reid to put the health care needs of We The People FIRST...not the insurance companies...not the appeasement of other politicians ! It is pathetic that 47 million Americans are struggling with NO health care coverage at all with millions more who are under-covered. It is absolutely pitiful that 45,000 Americans DIE every year due to the lack of needed medical care. The Democrats must STOP PLAYING THESE CON GAMES ! And Harry Reid is THE KEY !
" As Majority Leader We Expect You To LEAD our Senate Majority to PASS a STRONG PUBLIC OPTION BILL...NOTHING ELSE WILL DO...We're counting on (and watching) YOU." CALL SENATOR REID TODAY ! Health Care Reform is a matter of Life or DEATH ! To Quality Health Care For ALL ! Related article: Top House Progressive: Catering To Snowe "A Waste of Time"